Under spotless skies Sam and I took off from the Tiger Mountain parking lot in search of some seriously good downhill singletrack. I'd ridden Tiger back in the nineties - back when my bike were merely obsolete, instead of its current designation of "vintage" - and I remember a long fire road grind up to some stellar downhill single track. Today, looking at the map, I see that we were on the wrong track from our very first pedal turn. Instead of cranking up East Tiger, as was planned, we rode all the way around the Tiger Mountain Massif ending up, after a steep grind, at Poo Poo Point. 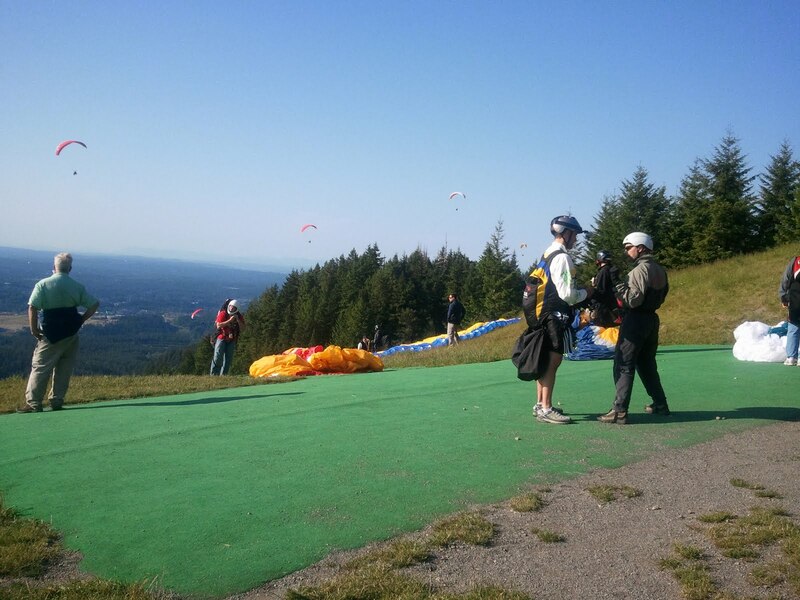 We took a break at the top to watch a few paragliders take off, I knew this place was popular but this was crazy - well over three dozen folks were either in the air or preparing for take-off. Maybe there had been a Groupon deal or something. We just had to turn around and ride back the way we came. After the initial descent all we had was miles and miles of uphill fire road. Sam got plenty and finally just said, "I'm tired of complaining." That was a new first. We'll have to go back to Tiger, but this time we'll take a map.